In which I hike 7 miles in 6 hours with 1 water bottle. Not one of my smarter decisions. You know how I recently updated my header tagline to read “travel, tea, misadventures”? Back in early March, I found myself with a weekend off from farm work and nothing to do. 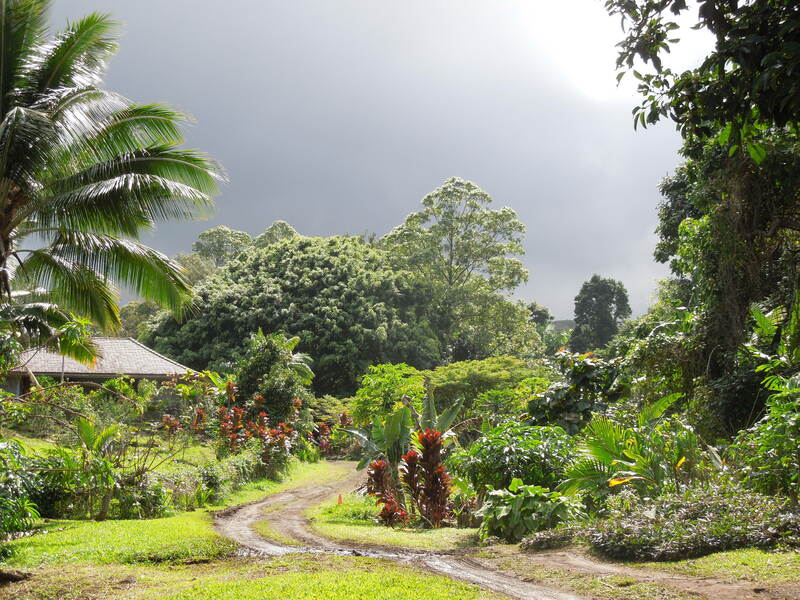 Another woman working at Hana Farms, let’s call her Alaska (because prior to arriving on Maui, she was living in Alaska), also had the weekend off and suggested we use our free time to go camping and hiking in Haleakala National Park. 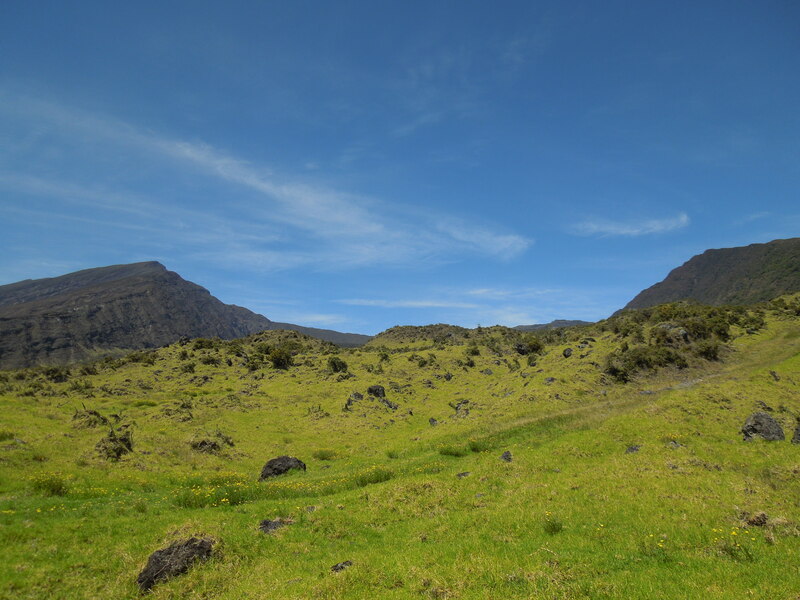 We had heard from the other farmies that the cool thing to do was to hike up “The Gap” into “The Crater” where the landscape was Mars-like and you could go camping. 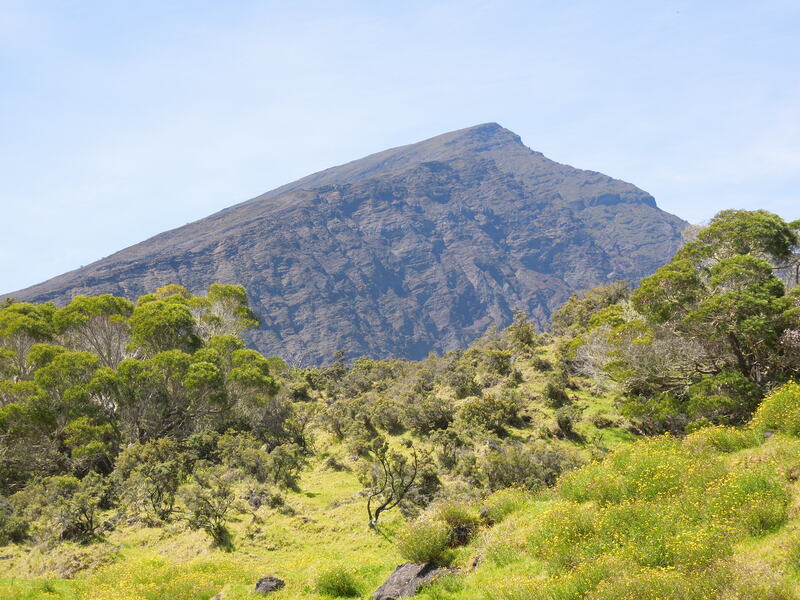 These two peaks are both a part of Haleakala — a shield volcano that has been eroded by volcanic eruptions, wind, and rain to create a large depression. 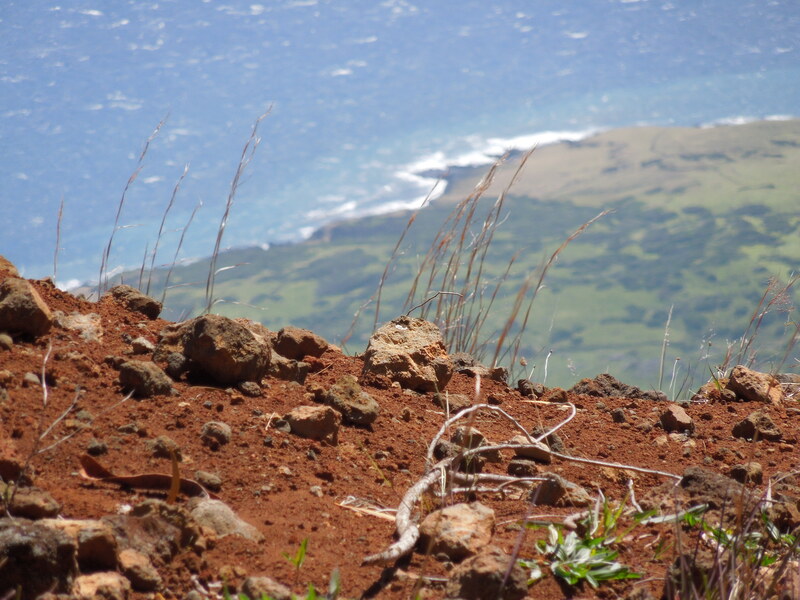 This trail is the Kaupo Gap and eventually leads into the Crater. The following day you could hike back down, but, because we got a late start, we decided to camp halfway between the farm and the Gap at Oheo Gulch — more commonly known as Seven Sacred Pools. 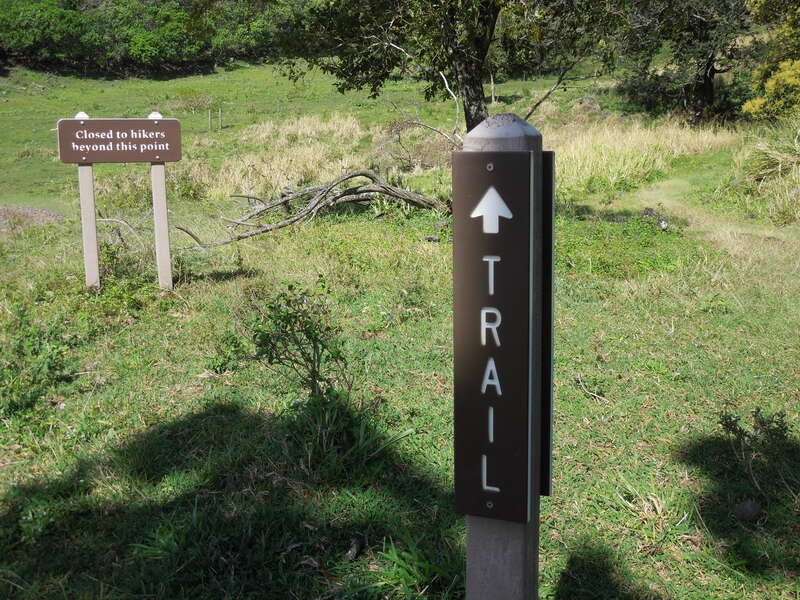 While Oheo Gulch is also a part of Haleakala National Park, and features nice day hikes with waterfalls and ocean views, it doesn’t have visitor access to the rest of the park. 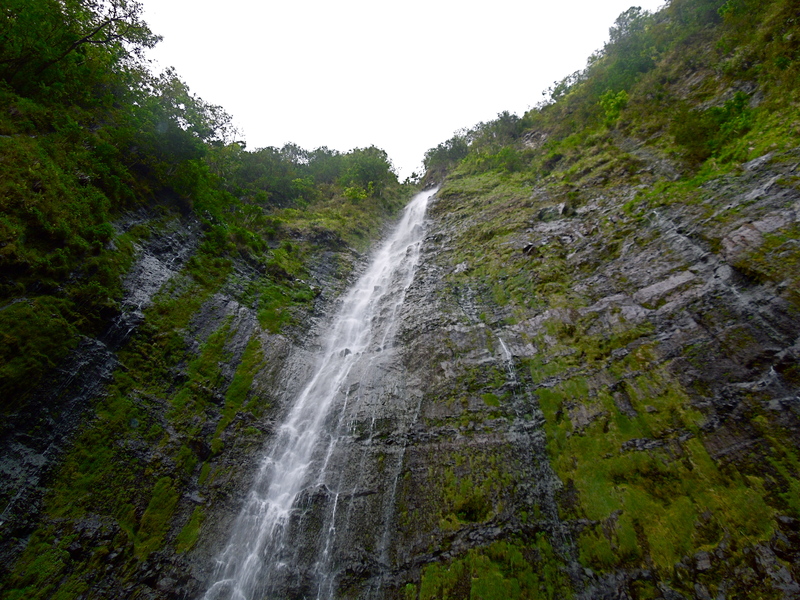 Waimoku Falls is an easy two-mile hike from the Oheo Gulch visitor’s center. After camping out, we drove the rest of the way to the Gap with the intention of hiking as much as we felt comfortable with. 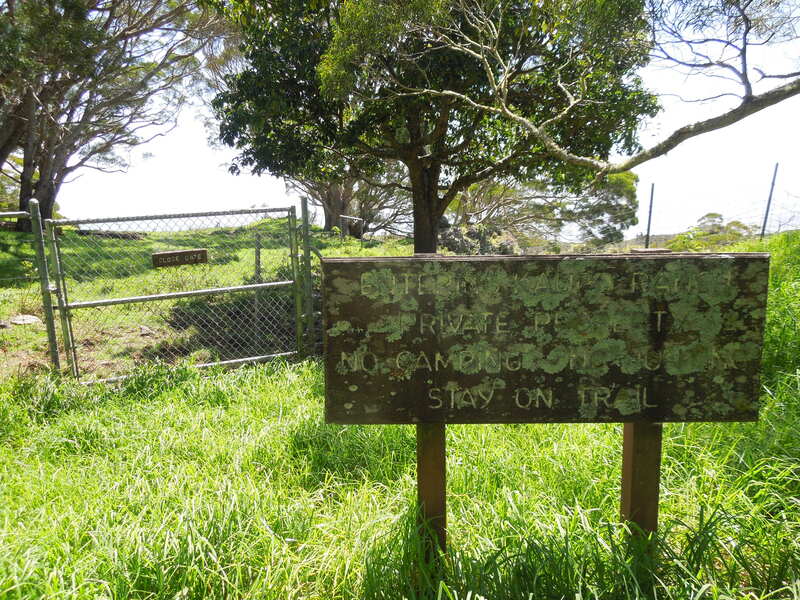 “The Gap” is short for the Kaupo Gap and is located in the tiny town of Kaupo. 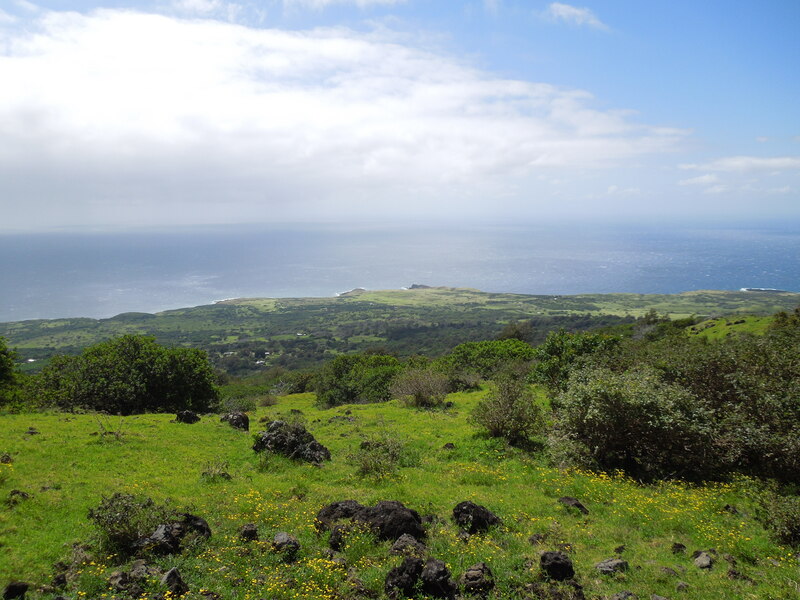 Our only explanation for how to get to this famed hiking trail was that it was up a small road on the right (the ocean is to your left) just before the Kaupo General Store. If you arrived at the General Store you had gone too far. Well, we arrived at the General Store. This was fine because we wanted to each buy a water bottle to have in addition to the reusable ones we had filled at our campsite. Unfortunately, the Kaupo General Store was closed — it was before noon on a Sunday, and we thought that they might just not be open yet. No matter, we turned the car around and found the first small road — it was no wonder we had missed it. The road was concrete, just wide enough for a single vehicle with tall grass growing on either side as well as in a large strip in the middle. 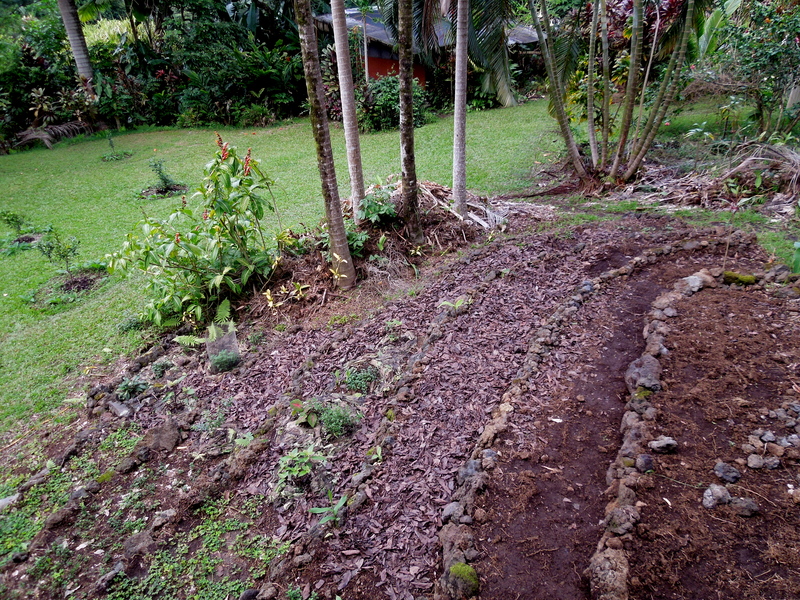 It was really more like two concrete ruts for our wheels than it was a road. We began driving up, sure that Alaska’s low-riding car wouldn’t be able to handle this trucks-only sort of “road” or that we were going to get in trouble for driving on what was clearly private property. 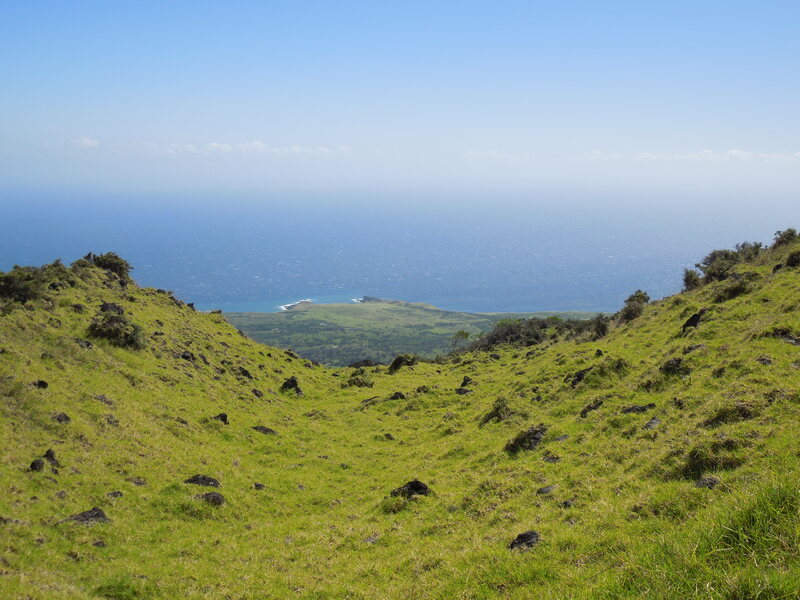 We had heard that the beginning of the Kaupo Gap is actually located on privately-owned ranch land, which the owners have graciously allowed hikers to use. So if you decide to attempt this hike, be respectful, and also be careful because it is ridiculously easy to get lost despite trail markers at regular intervals. The cow and tractor paths are more frequently trod and thus more easily followed. Finally, the road opened up enough to have a grassy shoulder, which we used as a parking lot, and our hike began. 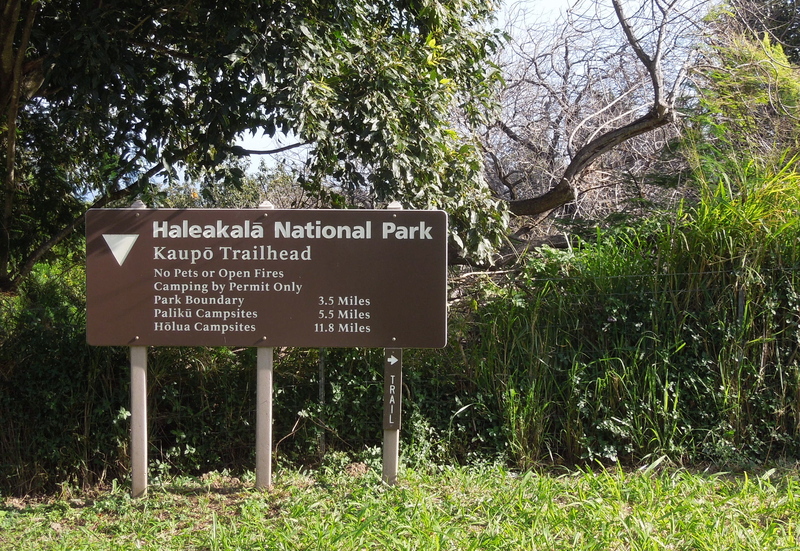 The road dragged on, and we worried it was the wrong one until we came to a sign welcoming us to the Kaupo Gap trailhead, and announcing that it was 3.5 miles until we would actually reach the entrance to Haleakala National Park. Until then, we would be hiking on private land. Well, friends, we pretty much only hiked on private land that day. The trail was steep, the sun was hot, our water bottles were small, and, as it turns out, Alaska and I are whiners. Why yes, if you bent over 90 degrees and peered through some bushes, there did appear to be a trail sign. When we looked back we could see down to the ocean. It gave a tangible measure of how far we were walking. We stopped for lunch under a shady tree. Our progress was slow, but we felt pretty good, especially after snacking on our makeshift lunch of avocado and beef jerky. Alaska was thirsty, and made the questionable choice of drinking a can of PBR with her lunch. 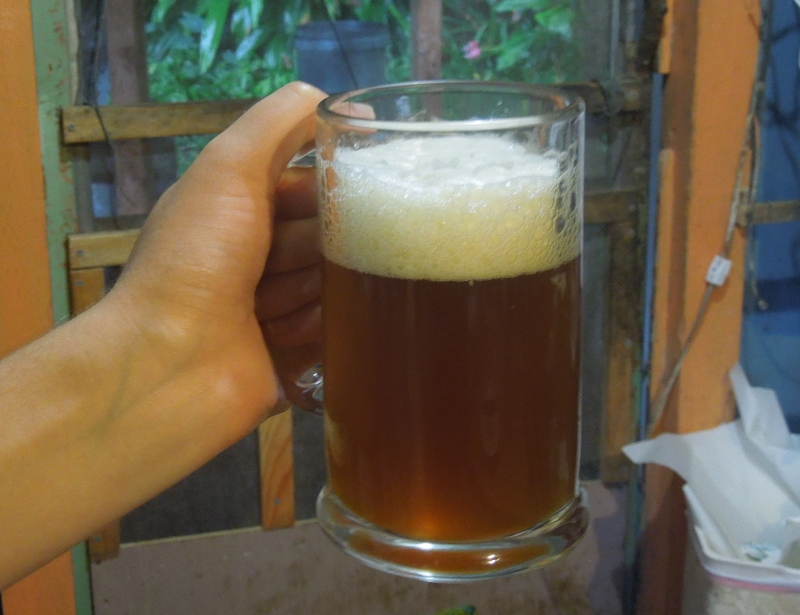 She always hikes with a beer so that when she arrives at her destination she can have a celebratory drink. In this instance, her explanation was that the act of drinking “felt hydrating,” even though she knew it wasn’t. We soldiered on, feeling as if we should have reached the National Park entrance by now. The landscape changed. The landscape changed some more. At this point, despite the beauty of our surroundings, we were getting tired. Alaska’s feet were hurting, so she had put on rainbow wool socks with her hiking sandals, we were both getting sunburned, and our water bottles were each less than a quarter full. How much farther to the damn park? Alaska pulled out her smartphone and tried to use its GPS to figure out our location. First it thought we were in the middle of the Pacific (not incorrect), then it showed a map of Maui inverted so that West Maui was to the East and East Maui was to the West. We were puzzled. It righted itself. We were disappointingly far from the gate. Really? We hadn’t even hiked 3.5 miles yet? Hadn’t it been like 3 hours? Were we really that sluggish? The answers to these questions were: yes, no, yes, and yes. Feeling too embarrassed to be the first to give up, we agreed to keep hiking. Feeling lightheaded from lack of water, we did not realize this was a potentially dangerous plan. We had seen no other hikers on the trail, but we agreed that if we saw one, we would ask them for water. No, we would tell them our sob story about the Kaupo General Store being closed and beg them for water. The sights continued to change and the so did the sounds. Lower down on the mountain, the wind would blow just right and we’d hear waves crashing against the rocky coastline. Higher up this sound was eclipsed by the thrum of bees. The meadows hummed with them. And then another sound broke through the din of buzzing workers — running water! We agreed to hike up one more hill and, upon arriving at the top, we were startled to see a man walking briskly down toward us. He carried a small hiking backpack, a fancy looking camera, and two water bottles. “How much farther to the park gate?” I called out. “It’s just up ahead — about 100 meters.” He seemed a little surprised I didn’t know this. Alaska mentioned that we hadn’t brought much water so we were trying to gauge how much farther to walk. He seemed disinterested, and did not offer to share. Buoyed by the promise of the park gate, we continued. But the sight of it was lackluster; an overgrown chain-link fence and a faded sign. We crossed through the gate and set foot in the park. We had arrived. Alaska suddenly had lots of energy and wanted to keep going despite how far she had fallen behind me during the previous leg of our hike. Nope. I was not interested. It was 2:00 pm, we’d been hiking uphill for 4 hours, and we had no water. Before we had much time to discuss our next move or marvel at our arrival inside the gates of the park though, we saw more hikers, this time with large overnight backpacks. They looked far more prepared than us. In fact, the woman in the lead, who was coming to talk to us, happened to be carrying a large jug of water. We made the briefest of small talk before inquiring about her water. The woman happily shared with us and howled when she saw Alaska’s crushed up beer can tucked into the pocket of her daypack, “You guys are drinking!” Alaska replied, “yes” as casually as she could while I tried not to make eye contact with anyone and focused on filling my water bottle. With an additional half bottle of water each, we still weren’t prepared to hike farther despite helpful-water-woman’s assertion that, “it’s only 4 more mile to Paliku, you’re almost there.” If by almost there she meant less than halfway, then yes, we were almost there. Yeah, we hiked up this. These more experienced hikers were waiting for us at the bottom of the trail and cheered when we came out of the woods. We arrived back at the car safely; it had only taken us 2 hours to hike down — half the time it took us going up. 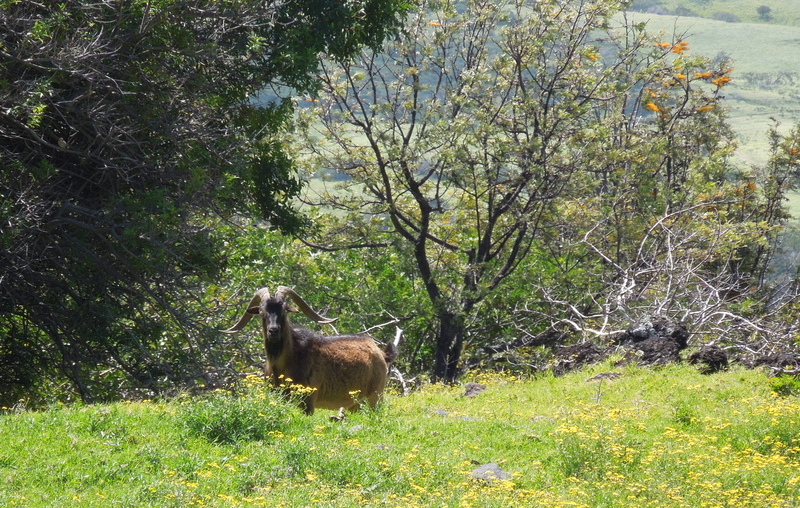 We later learned that while hiking up the Gap is popular with the farmies, most people get dropped off at the top of Haleakala, and hike down. In fact, the National Park’s pamphlets don’t even mention hiking into the park via The Gap, they only say that people can hike out that way. On our drive home, the Kaupo General Store was still closed, so we were unable to treat ourselves to sugary snacks and beverages. However, we managed not to die of dehydration because Alaska had a 2 liter jug of water in the trunk of her car the entire time. So funny. I did this hike in 1995 – before there were trail markers or formal landowner approval. I had been hearing about the hike for years, and having seen the fabled sunrise – I always dreamed of a full hike down to the coast. I finally had the opportunity to meet some friends on their way back from Japan so the 3rd person would drive to meet us. This was before the internet pretty much. We went from the top & had someone meet us at the store 2 days later. Like you – not enough water and woefully unprepared. I had presumed that there would be water falls all over the place or short hikes to a canyon wall & I did bring tablets. 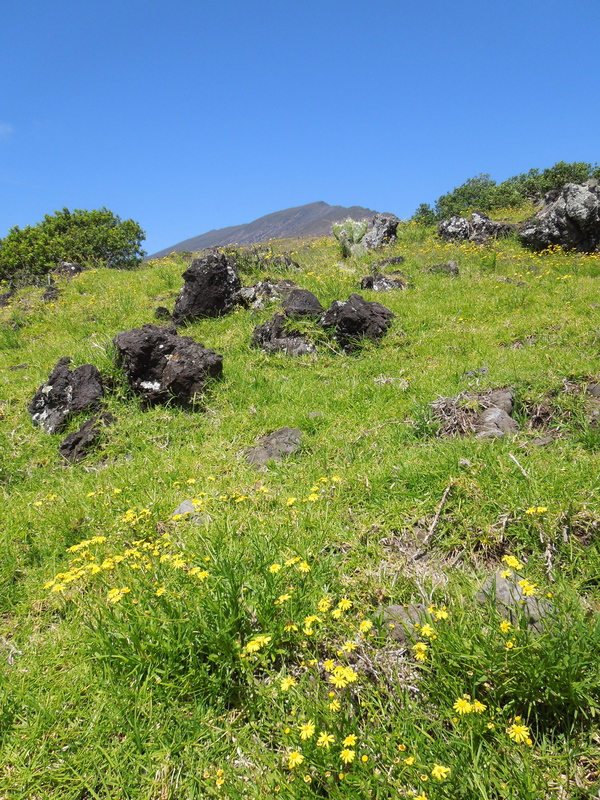 We met 1 hiker – who was just doing the crater and had likewise dreamed of the full hike of the gap. 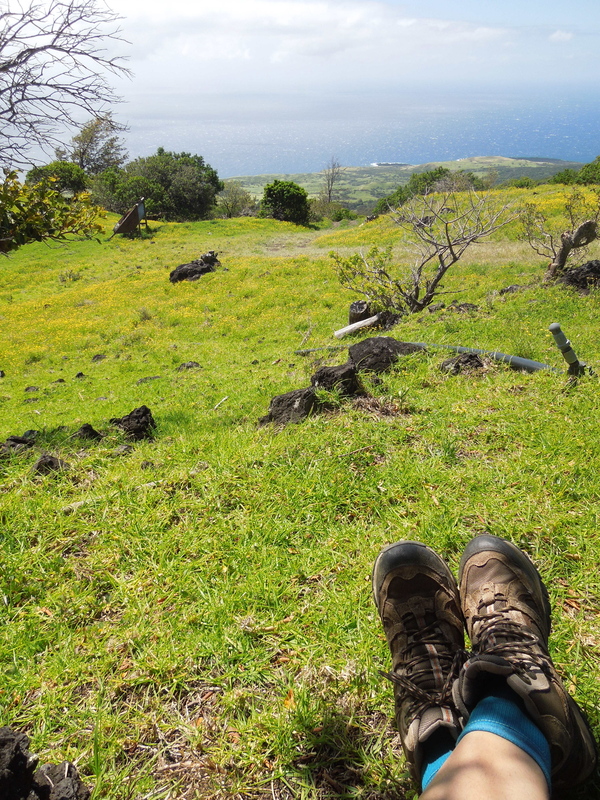 This was my most miserable hike – and all my fault. 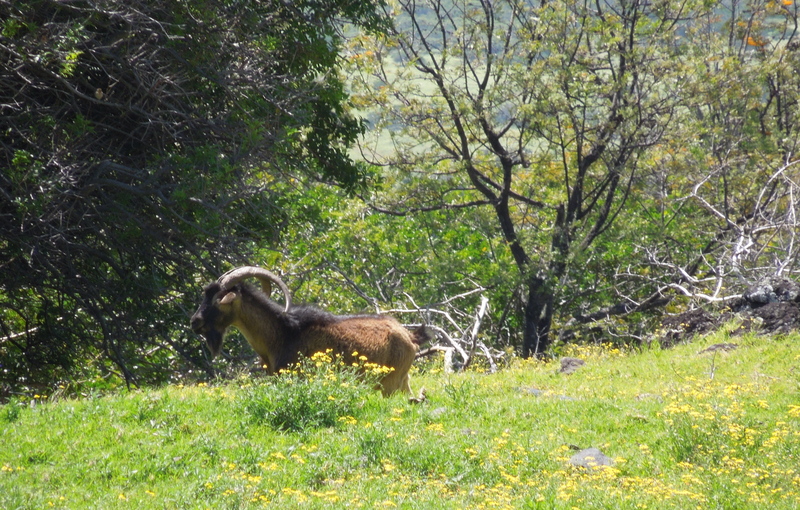 I am experienced – but got lulled into paradise – thoughts of a stroll along the 7 sacred pools. This thing is a brutal dehydrating desert. You failed to mention the steep narrow burrow trail 18 inches deep into soft pumice that fills the short top boots and cuts your feet to shreads. We traveled all night with short breaks because we were afraid that our feet would swell up and scab over if we rested more than an hour or 2. Thirst was critical – the most critical I have ever experienced. Another reason to keep moving. Very Impressive that you went up.